Welcome to my 3rd annual Devils year in review. As I have done the last two seasons, I will be presenting the season in review in three parts: stats, some fun with numbers, and what I learned on and off the ice. -Normally, I can handle myself no problem when I’m around any of the Devils (or even some of the opponents, for that matter). But the first night I saw Adam Henrique postgame during the third week of the season…I actually found myself literally starstruck. After all, all he did last season was score two playoff series clinching goals and almost win the Calder Trophy. But yes, I got myself together before he said hello. Sadly his hand injury in late November cut his visit short…and a week before all the fun Booster Club events too! -Remember last season and #FreeBurlon? This year it went to a whole another level, due to the lockout and the abundance of players on the roster. I have lost count of how many players we requested to be freed on both Twitter and on a number of signs. It got to the point where Harry Young actually wanted us to put up the signs! And yes, that actually made him crack a smile (baby steps!). -I created a new penalty just for Tim Sestito (know to my Jersey followers as the #ENERGY guy), the Sestito Penalty. Regardless of whether he was guilty or not of whatever infraction he committed, he always had to get the last word in with the referee. Next thing you know…extra 2 minutes, extra 10 minutes on the board. The douche otherwise known as Zac Rinaldo scored on a penalty shot? Yes, that actually happened. And I think everyone had the same reaction as Jeff Frazee. Cam and Jay Leach providing a majority of the offense in one game? Yes, that actually happened. I’m still looking outside for those flying pigs. If you’re bored while in Adirondack, you can always watch Marc-Andre Bourdon charm his date (or a random teammate) for the evening. This actually started last season when a friend witnessed the entire date (from introduction, to number exchange, to eventually leaving before the game was over), but with him still on the shelf from post concussion symptoms, seemed like every time I went up he was in the next section over from me charming a new girl. The other memory from up there was a scary one…being on hand when Mattias Tedenby took the skate cut to his jaw. I don’t think I had ever seen that much blood on the ice in all the years I’ve gone to games. Luckily he recovered and was back out there (and I even got my first good look at his cut last weekend) before the season was out. And thanks to Mike Testuwide (one of the Phantom scratches that night) for giving me the initial update. Tribute to Sandy Hook in Bridgeport. The main memory of my lone trip to Hartford was that it was the same day as the Sandy Hook shootings. 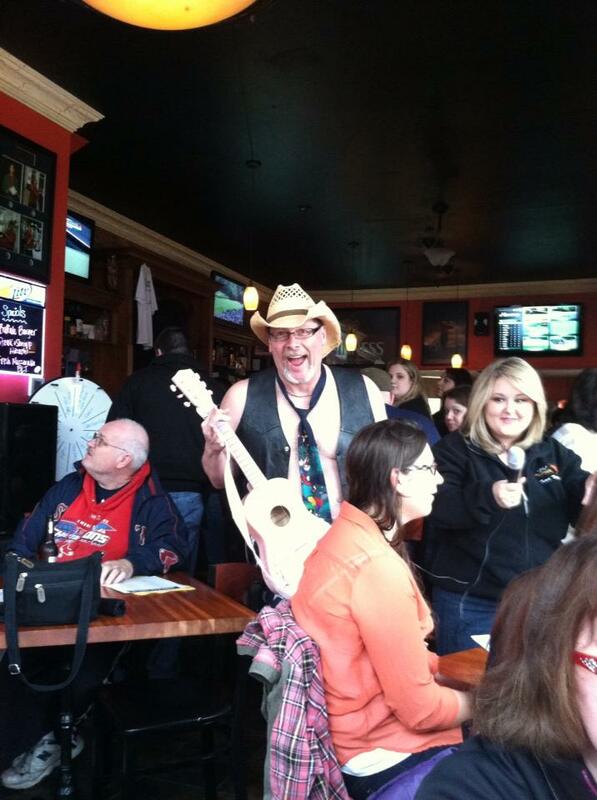 Every radio station in the Springfield/Hartford area carried the press conferences and news updates. The drive down there was a little numbing, but once I got in the building and got into game mode, it got better. 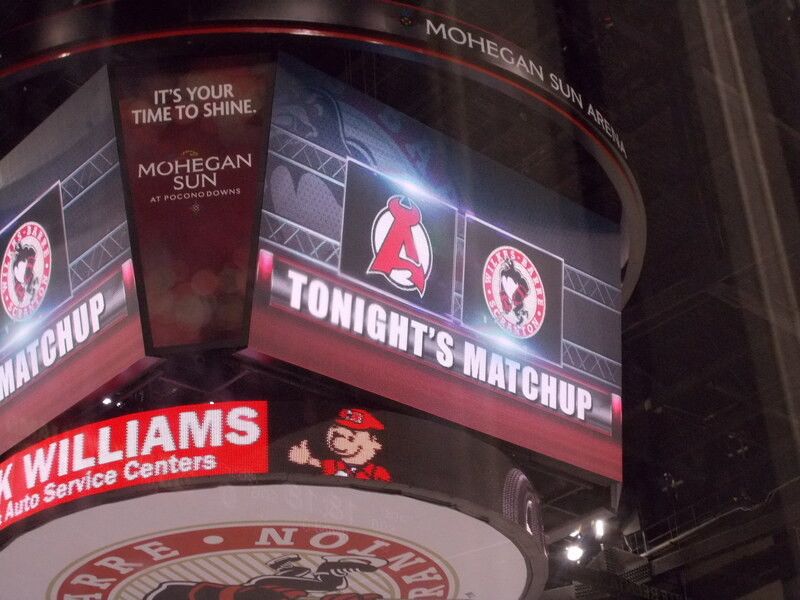 Wilkes-Barre has a pretty cool scoreboard…quite similar to the TU Center. Ah Wilkes-Barre. Where I always get booed by the same random tall guy and there’s a Tim Hortons booth (always a plus). While the game I saw wasn’t the greatest, there was another story that came out of this trip. On the way back up Interstate 81 towards New York, our bus was treated to the tail end of a fireworks show at PNC Field, where the Triple-A Yankees play. Then I find out the next morning more than fireworks happened. Um, oops? Yep, this guy. Shorts not pictured. Or racing the team bus down the highway…or late night Tim Hortons runs…the list goes on and on. With another season in the books, I just want to thank everyone for following along and reading. It’s amazing all the new friends I have found just via Twitter alone and meeting people at games, events, etc. Looking forward to an interesting summer and ahead to the fall to start Year #4! -It appears that Albany (and Adirondack) will need to find a new ECHL affiliate for next season. 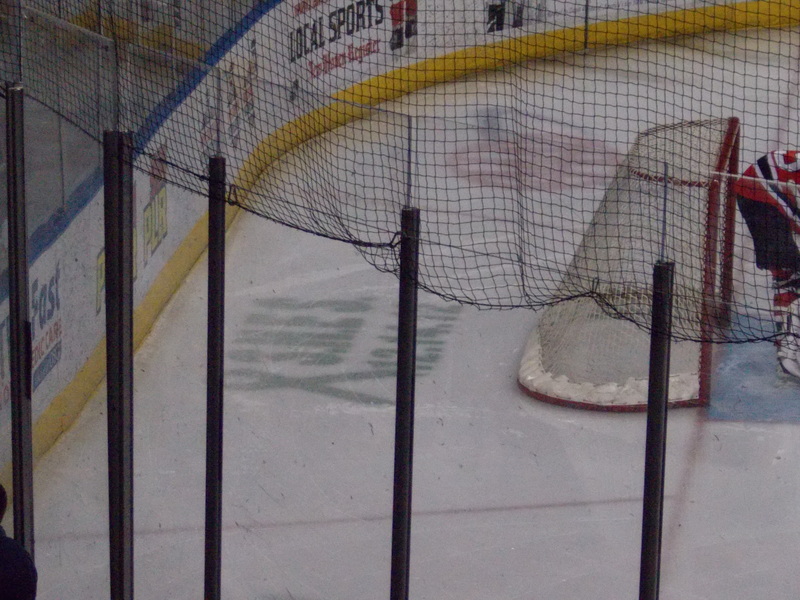 For the second time in three years, a Trenton ECHL franchise has ceased operations. The Titans made the announcement on Tuesday, with the goal of returning to the league in 2014-15. This happens just two years after the Trenton Devils left the ECHL, with the Titans taking over just a couple of months later, but wound up with the same rumored financial woes. 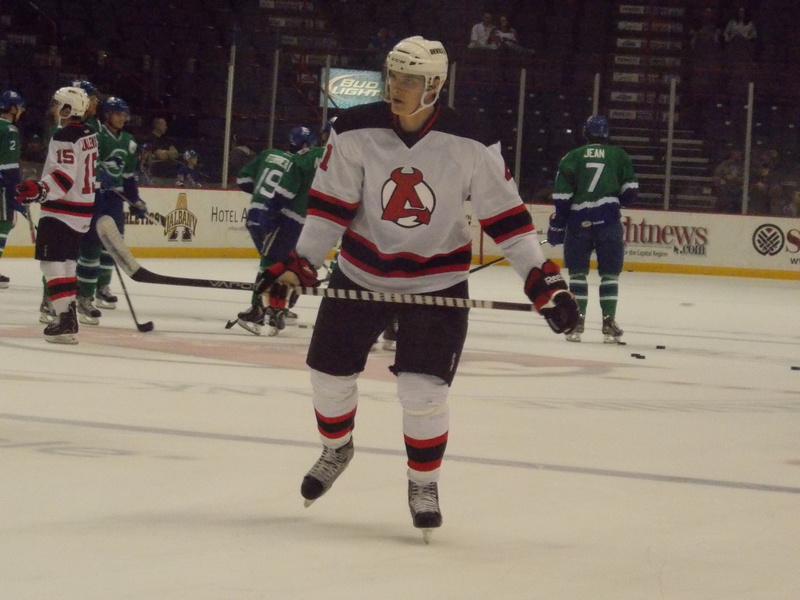 -Also on Tuesday, Harri Pesonen, Eric Gelinas, and Mike Sislo were all recalled to New Jersey. This is the first callup for Gelinas and Sislo, and the third of the season for Pesonen, who had appeared in four games in his previous callups. Alexander Urbom finally got in some game action in Tuesday’s win at home over Montreal. Gelinas will be making his debut in the home finale against Pittsburgh, not sure if the other two will get in on Saturday for the season finale in New York City. 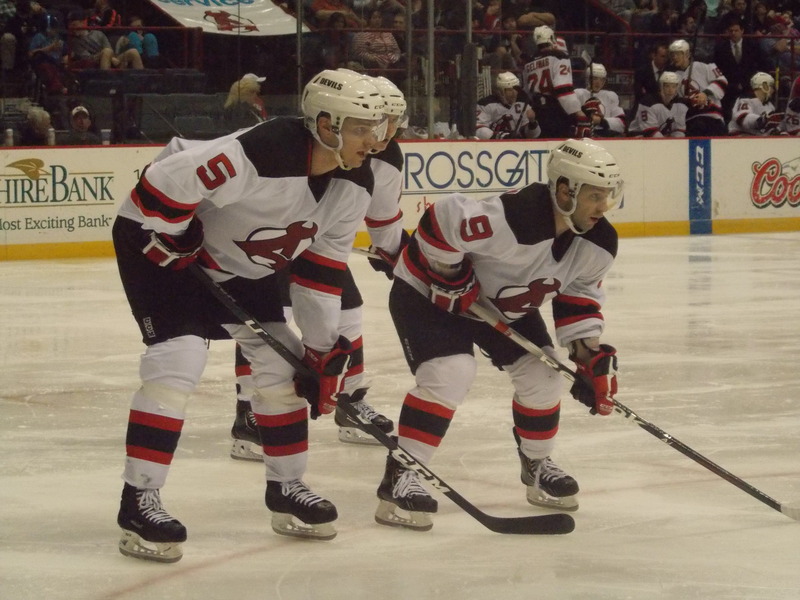 -Speaking of Devils…interesting story surrounding the whole saga with Stefan Matteau. For those that don’t know what happened, he had been benched during a QMJHL semifinal game over the weekend for basically taking a dumb penalty that cost his team (Blainville-Boisbriand) a goal. Instead of sucking it up and accepting it, depending on what story you read he essentially quit the team. But according to another source, he was released from the team after the game and was offered a plane ticket home. He chose to ride home on the fan bus (talk about an awkward situation…you’d likely never see that in the professional ranks). Here we have a 19 year old kid, first round draft pick, made his NHL debut during the season…but yet has a problem staying disciplined. I’m paying close attention to how this shakes out, because there is a good chance he may be playing here next season. Hopefully this is a lesson he can learn from as his playing career unfolds…just as long as it doesn’t turn into another Mike (Jefferson) Danton story. -Per CapGeek, it appears that Seth Helgeson has indeed signed a two year entry level deal. He appeared in four games after signing an amateur try out agreement on April 5th, registering no points and finishing a +2. -Per the AHL transactions, a formality today, as Helgeson, Reid Boucher and Jon Merrill were all released from their amateur tryouts. -In AHL news, apparently the Connecticut Whale are about to be no more, as the team ownership has decided to return to the old Hartford Wolfpack after switching to the Whale two seasons ago. Does this mean the old introduction is coming back? Or how about a new Norelco commercial? The official announcement should come within the next week. Pucky the Whale, we hardly knew ye. -As far as franchise silly season? Well, a rumor that first surfaced in late February never came to pass. It had been rumored that Calgary was planning on moving their AHL franchise in Abbotsford, British Columbia, to Utica, who last saw the AHL way back in the 1992-93 season when the Devils called the Aud home. It turned into a 3 way trade rumor: Peoria was being bought by Vancouver, who would then move the team to Abbotsford, paving the way for the Flames to go to Utica, while St. Louis (Peoria’s parent club) would take over Vancouver’s current AHL affiliate in Chicago. All came true this week, with the exception of the Utica move, as Calgary decided to stick with Abbotsford for at least one more season. Vancouver did buy the Peoria franchise, but without a chance of moving them to Abbotsford (negotiations met an impasse) they are first attempting to keep the team in Illinois. St. Louis and Chicago officially announced their affiliation agreement earlier this week. The only other move for sure is the Houston Aeros moving north to Iowa (who last saw the AHL in 2008-09 as the Stars, then the famous Iowa Chops), where they will be known as the Iowa Wild (sadly Chops sounds so much better in this case). -And finally, you can find first round matchups for the Calder Cup Playoffs here. Sigh. Someday. 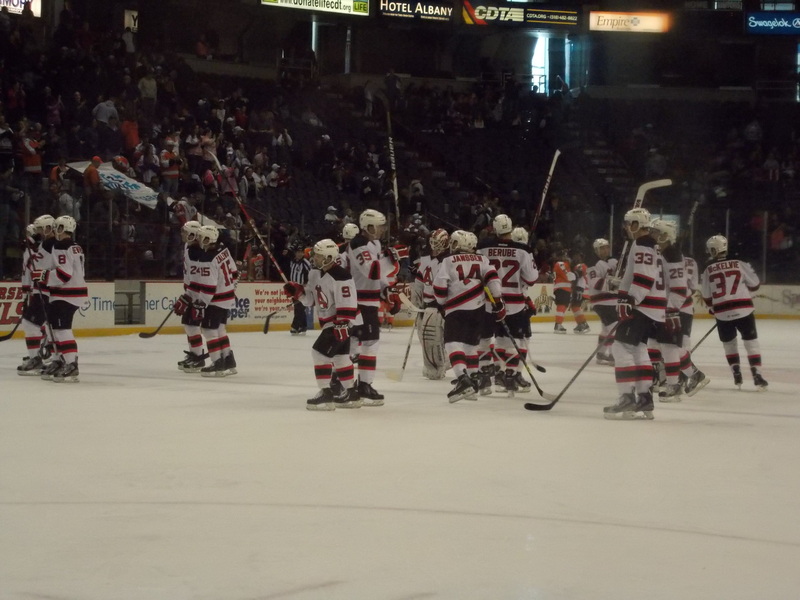 12: Shootout losses, a new AHL record. 9: AHL cities I saw at least one game (Albany, Adirondack, Connecticut, Bridgeport, Springfield, Worcester, Binghamton, Syracuse, Wilkes-Barre/Scranton). 3: Teams that swept the season series (Manchester, Portland, Providence). 10,218: Attendance on January 26th vs. Adirondack, a franchise record. 2,209: Lowest attendance, on March 27th vs. St. John’s. 11: Total shots in a 4-0 loss at Wilkes-Barre/Scranton on April 6th (season league low). 47: Most shots, on February 10th at Binghamton. 6: Most goals in a game, on December 12th vs. Wilkes-Barre Scranton and February 24th vs. Hershey. 7: Most goals allowed, on January 11th at Manchester. 55: Most penalty minutes in one game, on February 13th vs. Syracuse. 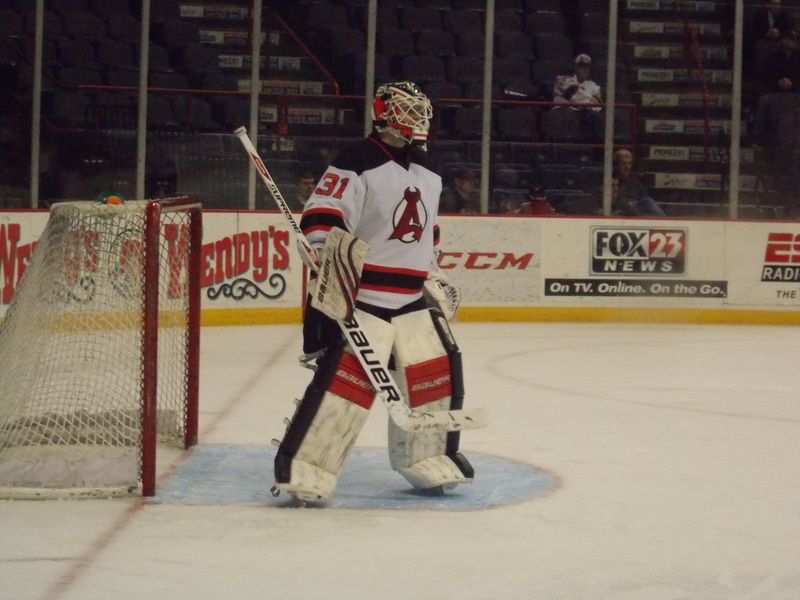 42: Number of players who made at least one appearance in an Albany uniform. 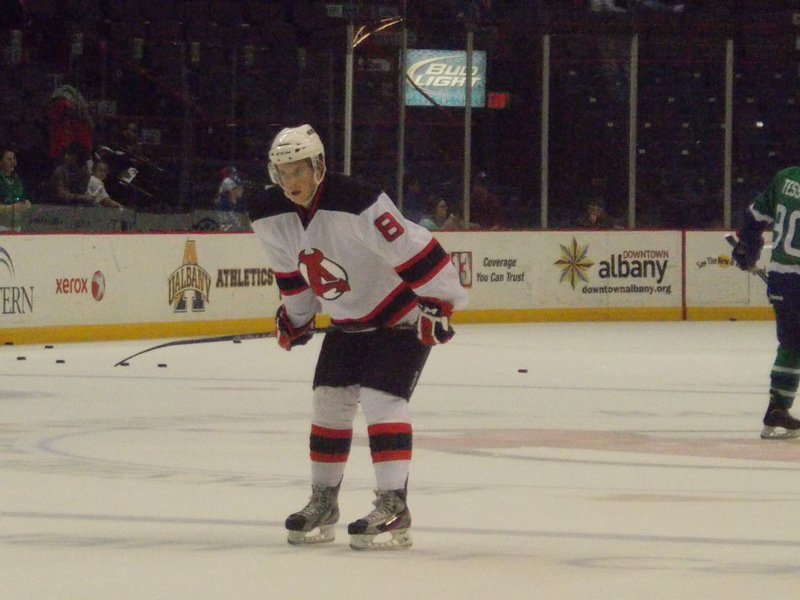 13: Albany players who played at least one game in New Jersey. 2: ECHL affiliates used (Trenton and Elmira). 4: Albany players that made their NHL debut this season. 0:39: Time lapse for a regulation win to turn into an OT loss at Norfolk on December 22nd. 7:58: Time lapse to erase a 2-0 deficit in Syracuse on February 9th with 3 goals. 9: Attempts before finally winning a shootout on February 5th in Connecticut. 9: Most shootout rounds, on December 15th vs. Providence. 0: Number of wins in overtime. 8: Most wins against 1 opponent (naturally, Adirondack). 4: Penalty shots awarded (2 to Harri Pesonen, 1 to Adam Henrique, 1 to Phil DeSimone). 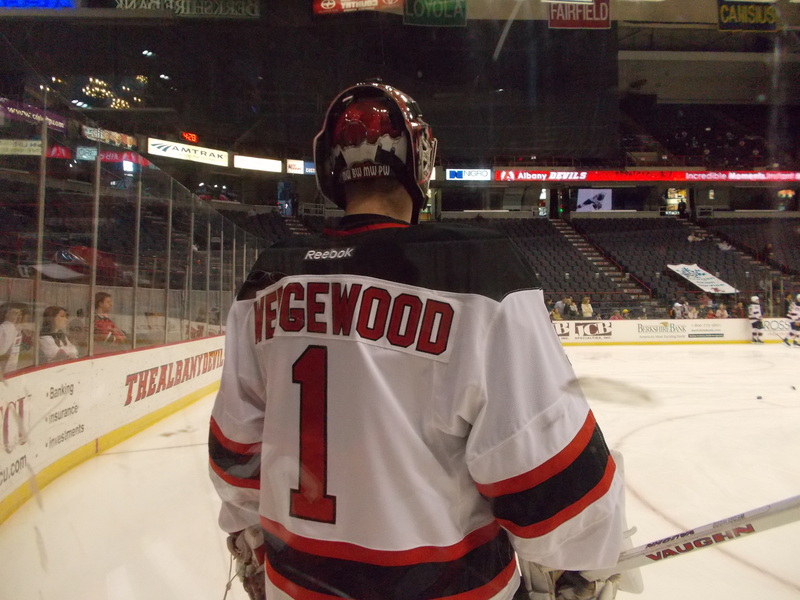 6: Penalty shots faced (4 by Jeff Frazee, 2 by Keith Kinkaid). 6: Shootout losses by Keith Kinkaid (tied for first in the league). 6: Shootout goals by Mike Sislo (tied for first in the league). 146,696: Total home attendance (including 4 games in Atlantic City). 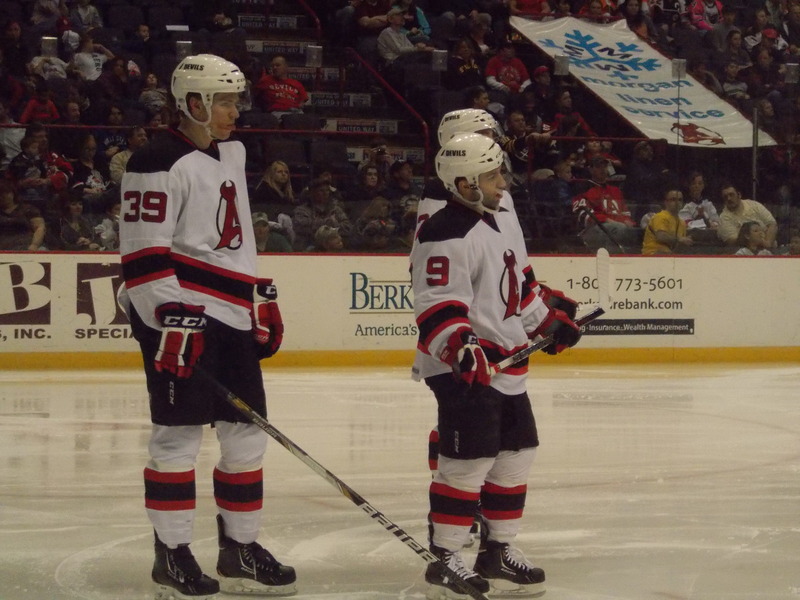 2: AHL Players of the Week (Bobby Butler in December, Matt Anderson in January). 7: Goal scoring streak at home by Joe Whitney from February 24th-March 30th (tied for first in the league). 4: Goals in one game for Bobby Butler on December 12th (tied with 1 other for season league high). 1: Shot in the first period on April 6th in Wilkes-Barre/Scranton (tied for league season low). 0: Number of players to play in all 76 games. 22: Most often assigned uniform number (J.S. Berube, Stephen Gionta, Cam Janssen, J.S. Berube again). I may add to this list as I think of more. Right now we’ll start things off with Part 1: Final Stats for the 2012-2013 season. Record: 31-32-1-12, 75 points. Home: 14-16-0-8. Road: 17-16-1-4. Full listing of individual stats can be found here: Skaters. Goalies. Record: 31-32-1-12, 4th place in division, 12th in conference, 24th overall. Penalty Minutes: 1,163 minutes for an average of 15.30 per game. Tied for 18th. Short Handed Goals: 10, 7th. Goals Against/Game: 2.96, tied for 22nd. I used the same categories as the last two seasons and once again, there have been some slight improvements from the season before. Standings-wise, not much change, just two extra standings points due to more losses after regulation. And for the first time, not last place in the division! Attendance saw a jump of about 400, thanks to some corporate season ticket initiatives. You could say the lockout had something to do with it, but actually some of the biggest crowds of the season came after the NHL resumed. A slight dropoff in penalty minutes, and that was even with the addition of Cam Janssen after the All Star Break (he actually came to play, not mix it up), so there was a little more disciplined play (well, other than the occasional Sestito Penalty…I’ll explain that later this week). Power play definitely had its issues, with a dropoff of 3 percent (not having Eric Gelinas early in the season hurt, among other factors), while there was a slight improvement in the penalty kill (which really saw a drop off as the second half of the season rolled on…at one point the kill ranked #3 in the league). Goals for and against did not change much from last year…offense was definitely still an issue, with only Joe Whitney as a real goal scorer (one can only wonder if Bobby Butler did stick around all season instead of being lost on the waiver wire…or even if Adam Henrique had stayed healthy during the last two months of the lockout). Again, it’s an issue that I hope will be addressed during the offseason. Goaltending, no matter who was in net, was really not an issue. It will be interesting to see who comes back between the pipes next season.